Well – if I wasn’t awake before I am now. I just walked outside to get the morning paper. It is cold and windy. Bitterly cold. Where is spring? Oh, right. Thursday. And a snow storm (20 cm) is supposed to be coming to Nova Scotia Tuesday/Wednesday. Winter, go away! Pounding a butterflied roast is very therapeutic. Perhaps this is the perfect time to think about wonderful, aromatic, homey roast. Pork roast, to be exact. One of the local grocery chains had boneless pork loins on sale last week for about $10. You know, the big ones that weight about 3kg, not the skinny ones. You can easily divide each one into three meals. So I purchased three dinners for $3.50. Not bad. Although each piece weighed in at about 1 kg (2.2 lbs) that’s a little skimpy if you plan on feeding a family of four. So the best way to stretch it is to butterfly the meat and and make a bread stuffing. Sprinkling with zest boosts the orange flavour. Think what butterflied pork loin chops look like in the store. They open like butterfly wings (or a book). In this case I cut it twice to make three equally thick "wings." It turned a 6” x 6” piece of meat into 18” x 6”. You may wonder if the exotic date and blood orange filling is a requirement. No. I did that because I had those ingredients on hand. You can just as easily substitute figs, apricots, cranberries, or even prunes. Substitute regular oranges for the blood oranges. The orange is important. It adds sweetness and brightness. This makes a wonderful weekend dinner able to serve four with a couple side dishes. Nothing says homey like the smell of a roast in the oven! On a separate note, my kéfir grains seem to be waking up and I put the Donvier ice cream unit in our freezer. So watch soon for how to make kéfir (possibly sparkling) and frozen yogurt! So come back and read more in the days to come. I always have something interesting going on! The filling has dates, but other dried fruit can be substituted. 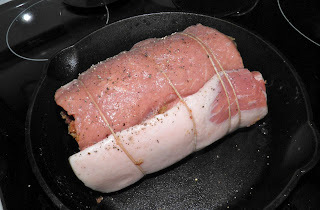 If your pork loin has a fat cap leave it on. Do not trim it off. 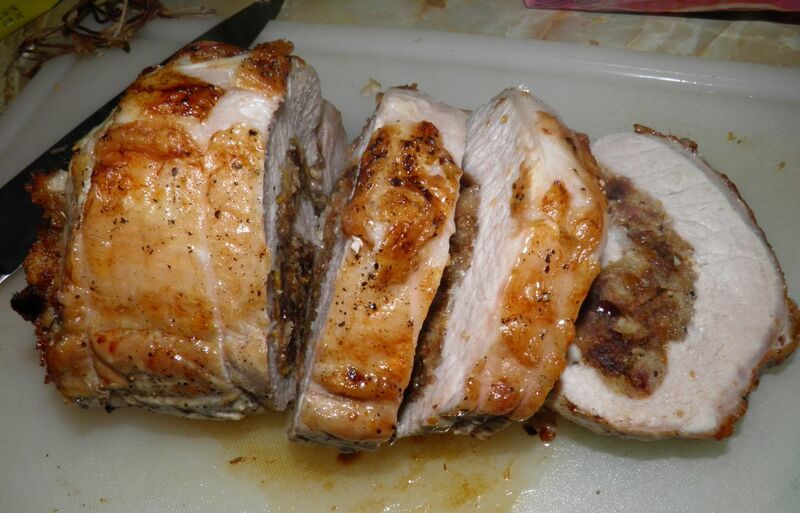 It’s necessary for keeping the lean meat moist while roasting. If not you may want to consider layering bacon on top for at least half of the roasting time. Take the pork loin and make a cut 1/3 through the thickness, but leave it attached so it opens like a book. 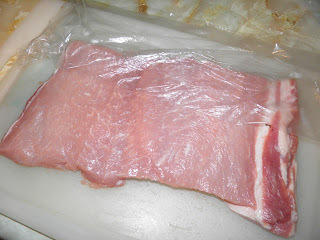 Then cut the remaining 2/3 thickness in half so the pork resembles an open letter that has creases from being folded in thirds. Cover with plastic wrap and pound with a rolling pin (or similar heavy device) to flatten it out evenly. (This is very therapeutic.) Make sure the fat side is facing down. Set aside. sure your twine holds it together. Preheat the oven to 350°F. Melt the butter in a skillet. Add half of the onion, garlic, ginger and dates. Sauté until the onion softens. Remove from the heat. Add the bread, marjoram and juice of one of the oranges. Season with salt and pepper. 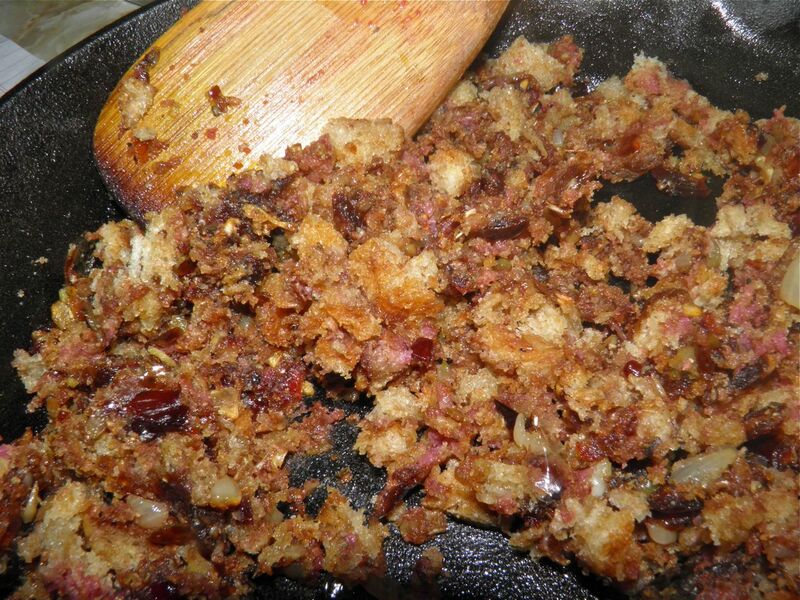 Mix the stuffing together well. 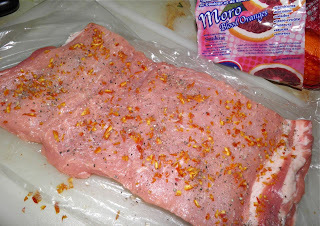 Remove the plastic wrap from the butterflied pork. 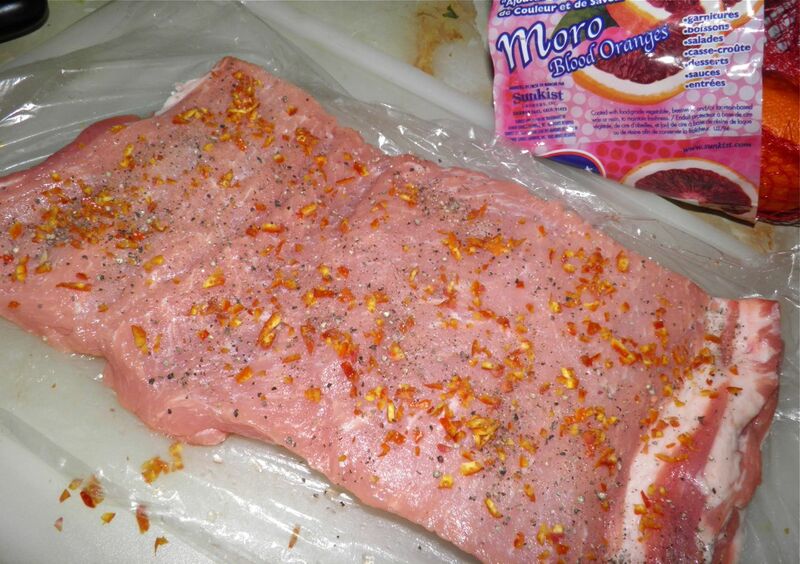 Sprinkle with salt and pepper and the orange zest. Then pat the stuffing evenly on the surface, pressing it down. Roll the roast so the fat cap ends up on the outside surface. Truss with butcher’s twine to keep it together while cooking. Heat an ovenproof skillet and brown the fat side of the roast. Turn the roast, pour the wine around it and place in the oven. Bake for about 1 hour 20 minutes, or until a meat thermometer inserted in the centre reads 170°F. Remove from the oven and let rest so the juices redistribute in the meat. Place the roasting pan back on the stove. Add the remaining onion and sauté until softened. Then add the remaining blood orange juice to deglaze the pan. Remove from the heat and stir in the remaining butter to thicken the sauce. Slice the roast and serve drizzled with the pan sauce. 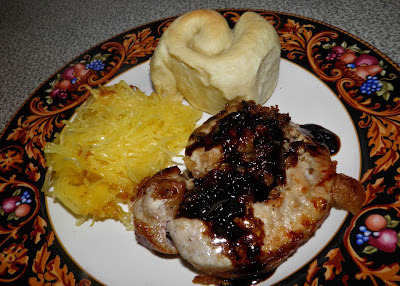 I made rolls and spaghetti squash to complete the meal.